It wasn’t that long ago that moving business documents between a company and its partners or customers was a complex, time-consuming, and cumbersome process. It was a highly manual effort, with documents from purchase orders and invoices to receipts and payments exchanged through such means as emails, faxes, and traditional mail. On each end were humans inputting the data into their computing systems and handling the transmission of the documents. And as with most manual processes, it was slow, inefficient, costly, and error-prone. Mistakes in data entry were common and the pace of processing the documents could not keep up with a modern business environment that was moving at increasingly fast speeds. Enter electronic data interchange (EDI). EDI began coming onto the scene about three decades ago, promising to move the business of processing documents from a manual to a digital one. It shifted the equation by making the exchanging of business documents a computer-to-computer process rather than a manual one. Accuracy and efficiency improved, processes accelerated, costs were reduced and security increased. In a fast-moving and volatile market like electronics, EDI was a breath of fresh air. That said, for all the improvements EDI made in the document exchange process, it hasn’t been a cure-all for everything that ails the semiconductor industry and how business is done there. Even with EDI, there are still complexities and challenges that can slow down the system and create inefficiencies. There are multiple EDI formats and standards – EDIFACT, ANSI, XML and UBL, to name a few – and the process involves running data entered in a system by one organisation and running it through a series of translation, mapping and processing steps, where multiple points of error and exceptions lurk that can introduce costs, create inefficiencies and be a drag on the system. When exceptions occur, customer service representatives (CSRs) often have to call in the IT team to fix the issue, which means the company is paying two people to manage a single problem. Exceptions also can have a domino effect up and down the supply chain and the myriad stakeholders involved and can damage relationships between an organisation and its partners. For a rapidly changing electronics industry that sensitive to pricing and revenue fluctuations, EDI exceptions can make life that much more difficult. This is where automated order processing software can help alleviate many of the problems stemming from EDI exceptions. Solutions that integrate with an already existing EDI can help reduce the costs that come with EDI exceptions, simplify how formats and systems are managed and complement an existing EDI infrastructure. An order processing automation solution acts as an overlay of the EDI system, translates orders into a human-readable form and ensures that there is full visibility and control over every order. With such EDI integration solutions, the handling of exceptions also is automated and can be resolved by the CSR, eliminating the need for an expensive IT professional to fix a problem. EDI orders can be treated and processed like any other order, like fax, email or paper. In addition, invoices can be sent through whatever channel and transport protocol – like AS2 or SFTP – the customer prefers. CSRs have greater control and visibility over not only the orders but also the customer and partner relationships. They can verify and make corrections to orders, start the workflow, better manage SLAs and orders, and spend less time on paperwork and more time working directly with customers and partners. Efficiencies are improved, and costs are reduced. With an order processing automation solution, the time spent processing EDI orders is reduced by an average of four days over when there are manual steps in the process. According to one company, the introduction of order processing software reduced its order processing time by 50% and kept an accuracy rate of 99.5%. By reducing the amount of human intervention in the process and the errors that come with manual intervention, order processing automation improves the security of the data that is passing between an organisation and its customers and partners. 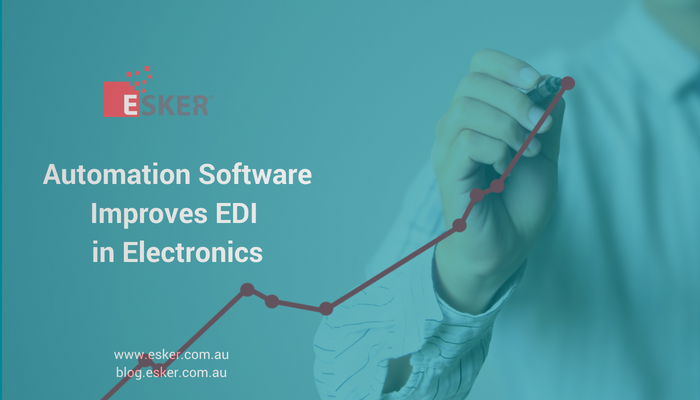 EDI was a significant step forward in streamlining the processing of exchanging business documents and was an improvement in electronics business software. It moved the dial on the digitisation of order processing and management, reducing many of the challenges that come with manual processing. But there were still inefficiencies, complexities and exceptions involved with EDI, many of which can be addressed through the use of order processing automation solutions to improve and complement EDI infrastructure.